After some Google searching, I found that we need to be on the same page when we are talking cans per pound because there are 6, 8, 10, 12, 16 oz. pop top cans PLUS screw top “bottle” cans and others. So using standard 12 oz. pop/beer cans that are rinsed and dry I find that the consensus is that it takes from 32-35 cans to make a pound. There seems to be no exact number because there are variances by brand. So now we basically know about how many cans one has to gather together to make a pound a make some money. And it’s going to take more than a twelve pack to make a pound. So let’s get drinking and collect those cans and change them in to buy more and recycle more. What a great win-win deal. Hmmm I can taste it now… Coca-Cola, Captain and Coke, Coors Light… how much more fun could it be to recycle and save the planet? 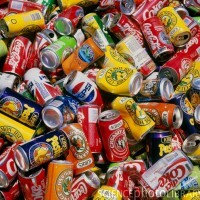 At Yaeger Auto we are paying cash for aluminum cans every day, Monday through Saturday. Stop in TODAY!